It’s easy to take accessible medical treatment in Australia for granted. If you’re an able-bodied person living in or near an urban centre you’re likely to have a suite of medical services at your fingertips, should you need them. But what happens if you’re elderly and getting about is an issue? Or if you live on a remote area and your closest GP (or speech pathologist, occupational therapist or dietitian) is located hundreds of even thousands of kilometres away? It’s the equivalent of having Netflix AND Stan versus a VHS rental shop that’s only open every second Tuesday. That’s where Coviu steps in. A spinout of our Data61, Coviu is a cloud-based video consultation platform removes the need for physical presence during doctor-patient consultations. 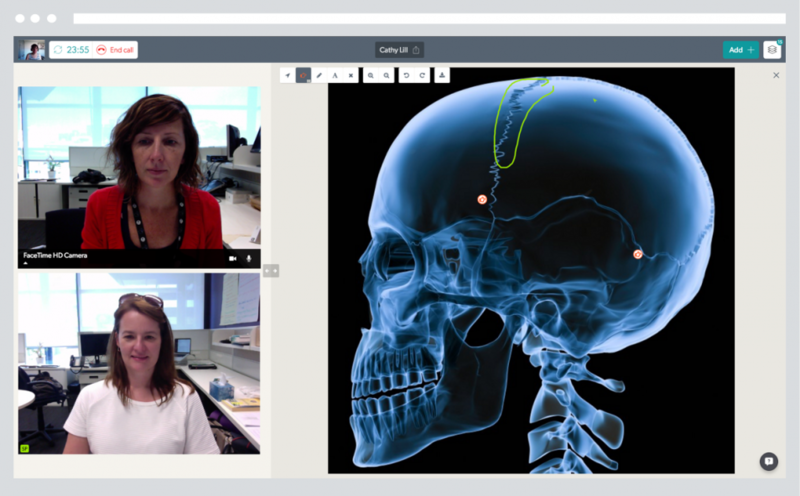 It has features like interactive whiteboards and the ability to share and annotate images, flyers and x-rays to enable clinicians to explain diagnoses and procedures. Practitioners of all professions are able to set up a video consultation environment in under five minutes and start delivering their services on mobile, desktop and Web platforms in a unified manner, using standard web conferencing tools. Using artificial intelligence-based tech, Coviu is capable of image analysis to identify cancers, calculating the range of motion of limbs, and can even work with patient booking and payment systems. And it cuts down on costs for patients and providers alike, allowing services such as specialist referrals or prescription renewals to be offered without the need for an in-person appointment. Coviu is currently being used by more than 1100 healthcare professionals including physiotherapists, speech pathologists, occupational therapists, dietitians and nutritionists and general practitioners across the country. And in further good news, it has just raised $1 million from venture capital firm Main Sequence Ventures to provide Australians with even more access to interactive medical treatment in the comfort of their own homes. Here’s what our Chief Executive, Larry Marshall, had to say about it. The $1M investment comes from our Innovation Fund, which is managed by Main Sequence Ventures. Coviu’s growth has also been aided by our ON Accelerator program. Both Main Sequence Ventures and ON are supported by the Government’s National Innovation and Science Agenda (NISA). It's expected that over 20,000 Australians will have used Coviu by the end of 2018. Find out if you could be in the picture.